Dhaka, 1 April, Abnews: Prime Minister Sheikh Hasina today said the government is going to expand cub scouting in primary schools. She said this while inaugurating 6th National Comdeca of Bangladesh Scouts at Charvanga of Haimchar Upazila here today. A project for expanding cub scouting in primary school level would get government approval soon, the prime minister said. The prime minister said the government has given permission to use 95 acres of forest land for the National Scouts Training Center. The government has allocated land for construction of scouts building and training center in every district, she said. President of Bangladesh Scouts Abul Kalam Azad presided over the function while National Commissioner Mozamnel Haq Khan and national commissioner (special events) Md. Mofazzal Hossain spoke on the occasion. A team of Chandpur Scout and Rover Scout gave salute to the Prime Minister. About 7,500 scouts are taking part in the 6th National Comdeca (Community Development Camp). Praising the role of the scouts in social development activities and grooming up children as worthy citizens the prime minister said scouts would take forward the country with the ideals of war of liberation. She also commended the role of scouts in disaster management activities at home and abroad saying their services and participation in different camps outside the country has brightened country's image. Bangladesh Scouts has earned Growth Award from the World Scouts Council for growing number of scouts in the country, she said and extended her thanks to the members of Bangladesh Scouts and leaders for the achievement. Sheikh Hasina said her government is giving all support for development of scout activities in the country. A project at a cost of Taka 122 crore is being implemented for construction of Scouts Shatabdi Bhaban. The prime minister urged for strengthening service programmes of scouts. Scouting activities should be strengthened in all educational institutions and communities, she said. 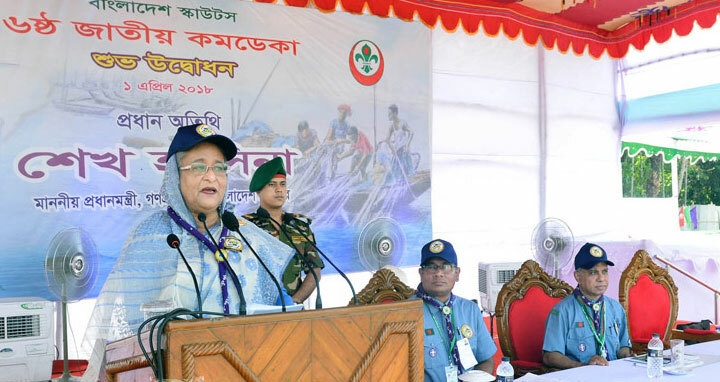 Sheikh Hasina said the government has given directives to form at least two cub scouts and rover scouts units in every educational institutions and at least one girl-in-scout unit in every girls school and college. All infrastructural facilities would be created in every district for expansion, development and monitoring of the scouts activities, she added. The prime minister urged the scouts to build themselves as worthy citizens of the country, love people and devote them for welfare of the people.